Make patterns using Easter Eggs or Legos. 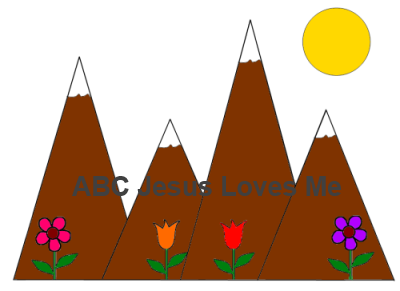 Using this image as the example, create a flower and mountain art piece made of construction paper. Have the child cut out the basic shapes (sun - circle, mountain - triangles) and glue onto a piece of paper. Add flowers with a fingerprint and then draw stems and leaves. - Hide Easter Eggs filled with pieces of paper with numbers and letters on them. Once the eggs are found, have your child name the number or letter's name and sound. When all are found, have your child put numbers or letters in sequential order. Fingerpaint various letters, numbers, and shapes.